Botulinum toxin contains a specially prepared naturally occurring protein that originates from bacteria. This provides unparalleled treatment for frown lines, forehead lines and periorbital lines (crow's feet), as well as having a large number of specific clinical indications including migraine treatment and excessive underarm sweating. Botulinum toxin blocks signal transmission at the nerve junction with the facial muscles, thereby relaxing them. Treatment is ideally aimed at partial muscle block, thus allowing facial expression to appear more natural. · Delaying the otherwise natural deterioration of lines/wrinkles with increasing age, while Botulinum toxin is used. · Periorbital laughter lines (crow's feet). ​ Due to the need to balance the relaxation of opposing facial muscle action, in some people/skin types treatment of horizontal forehead lines alone is not recommended without the glabellar region also being treated at the same time. Results may be obtained from 4-14 days after the first treatment. Frown lines will look more relaxed and softened. We aim to provide natural looking treatments. As the effect is developing the muscles may relax at different rates but by 2 weeks this has usually evened out e.g. you may be able to raise one eyebrow higher than the other until the full effect is achieved. · Side effects are rare. Occasionally temporary drooping of the eyelid can occur. This may last a few weeks but can be treated in the interim with special eye drops . · Treatment is not recommended if you are pregnant or breastfeeding. 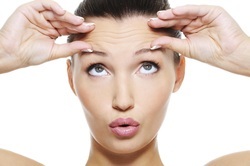 ​There are several types of Botulinum toxin available - most people have heard of Botox. Other brand names include Azzalure and Bocouture and we can provide all of these on request. Results usually last for between 3 and 6 months initially. After that, you may be ready for a follow-up treatment. With repeated treatments, performed before the full effect has worn off, most people will find that the results will last longer over time. Duration of results will depend on your facial expressions.